Trump's Flip-Flops On Economics Move Policies Toward The Status Quo President Trump is beating a path back toward the center on economic policy. Some economists think it may be due to influence from Trump advisers like Gary Cohn and Jared Kushner. Trump's economic adviser Gary Cohn (left) and adviser Jared Kushner listen to President Trump at a meeting with business leaders Jan. 23. President Trump's economic policy pronouncements have taken some twists and turns this week. From Chinese currency manipulation to his choice to head the Federal Reserve, Trump contradicted statements he'd made during the presidential campaign. In doing so, Trump is departing from some of the radical changes he promised, and moving toward the positions of his predecessors. Until now China was a frequent target. Over and over during the presidential campaign, Trump pilloried China, accusing it of manipulating its currency. "I'm going to instruct my Treasury secretary to label China a currency manipulator! The greatest in the world," Trump said at a Florida rally last year. In 2015, Trump even penned an op-ed in The Wall Street Journal called "Ending China's Currency Manipulation." But in an interview with The Wall Street Journal this week, Trump did an about-face, saying, "They're not currency manipulators." Trump's new view of China aligned him with the mainstream conclusion that China stopped manipulating its currency to boost exports several years ago, well before Trump's statements to the contrary during the campaign. Derek Scissors, a specialist in U.S.-China economic relations at the conservative American Enterprise Institute, says Trump's opposing characterizations of China are both justified. "It's legitimate as a candidate to run against the history of Chinese action, because that affects the American people," he says. "But as president you have to deal with what's going on now. And with what's going on now, China is not a currency manipulator right now." Economist Dean Baker of the left-leaning Center for Economic and Policy Research says the timing of Trump's change of views was likely related to an annual report on trade manipulators that is due from the Treasury this weekend. "I don't have any advance knowledge of the report. But I'm assuming it will not be labeling China as a manipulator," Baker says. "And [Trump] had to lay the groundwork for that, because during the campaign, he made that his commitment. 'As soon as I get in office, we're going to label China a manipulator and take action against them.' "
Baker says he's a little disappointed that Trump seems to be dropping the currency issue. Baker believes China still manages its currency in a way that perpetuates huge trade imbalances with the U.S. and hurts U.S. manufacturing. "We can't reverse history. We can't get back to where we were 20 years ago and bring back all the jobs that were lost in Michigan, Ohio and these other states," he says. "But we could make a difference if we had something closer to balanced trade." The Obama administration had at times called China's currency "significantly undervalued," but didn't take the step of labeling the country a manipulator. Also this week, Trump reversed his view of the Export-Import Bank, a government agency that provides loan guarantees to finance U.S. exports. During the campaign he complained the bank wasn't supporting "free enterprise," because it was unfairly subsidizing exports from big companies like Boeing, General Electric and Caterpillar. It was a position similar to small-government conservatives like Rep. Jeb Hensarling, R-Texas, who opposed the bank and called it "corporate welfare." But on Wednesday, Trump told the Journal he no longer wants to eliminate it. That's a similar position to Obama, who had advocated for the bank's role. Baker says Trump is no doubt getting an earful on this matter from the CEOs he has been inviting to the White House. Export-Import Bank Debate: 'Retreat From Sanity' Or End of Corporate Welfare? "These large firms are all politically powerful and when you're actually sitting there at the White House, they're talking to you," he says. 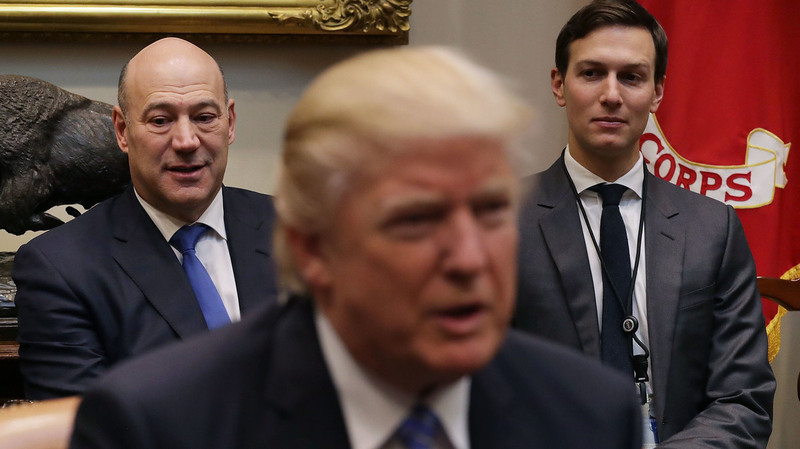 The AEI's Scissors believes Trump's top White House economic adviser, Gary Cohn, formerly of Goldman Sachs, has probably helped move Trump to more mainstream business views on the Ex-Im Bank. "They want the government involved in certain financial deals," Scissors says. "And the free market types — which includes me, by the way — don't want the government involved, because the Export-Import Bank doesn't spread the money evenly. It chooses certain companies to support." Others see Trump's move to more mainstream policy views as evidence of the waning power of populist Steve Bannon in the White House and the ascendancy of Trump's son-in-law Jared Kushner. Trump also suggested to the Journal that he could still reappoint Janet Yellen to another term as Federal Reserve chair — something he said before that he wouldn't do. And after accusing Yellen of keeping rates low to help President Obama, Trump said he'd like to see interest rates kept low for him, too.